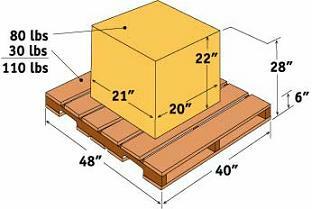 In cases where the shipment is palletized, the dimensions of the pallet determine the cubic dimensions. Although the original dimension of the carton remains the same, the cubic dimensions now include those of the pallet. For a length of 48", a width of 40" and a height of 28" (20" plus 8" of pallet) equals 53,760 in.3 / 1728 = 31.11 ft3. and has a corresponding class code of 250.